This illustration shows the system V 391 Pegasi as it was about 100 million years ago, when the star was at its maximum red giant expansion. Copyright HELAS. Artist Mark Garlick. Astronomers have spotted a planet that has survived the massive ballooning of its parent star, providing the first optimistic evidence for the long-term survival of Earth. The discovery, detailed in the Sept. 13 issue of the journal Nature, could motivate other scientists to look for similar red giant survivors. That in turn could eventually lead to an answer to one of astronomers' favorite questions: Will Earth survive the sun's swelling when it goes through its own red giant phase in a few billion years? "The fact that we have found this planet proves that a planet with a small orbital distance can survive" a star's red giant phase, said study team member Roberto Silvotti of the National Institute of Astrophysics in Naples, Italy. The parent star, V 391 Pegasi, belongs to a rare class of red giant stars known as B-type subdwarfs that have prematurely expelled their outer shells of hydrogen. At one point, V 391 Pegasi was a star much like our own sun. As it evolved and grew old, its core ran out of hydrogen fuel. The star's core contracted and began burning helium instead, while its outer shell expanded by a factor of about 100. Scientists think our sun will undergo the same expansion when it runs out of hydrogen fuel in about 5 billion years. After a while, most red giants expel their outer envelopes to create planetary nebulas, revealing dense, stellar corpses known as white dwarfs where the core used to be. But for reasons that are still unclear, V 391 Pegasi expelled its outer envelope early, before the core even began fusing helium, exposing a compact, dense star that has not yet fully died. Only about 2 percent of stars that reach the red-giant phase are thought to undergo the same catastrophic mass loss that V 391 Pegasi did. "This is a rather particular kind of star because 98 percent of these stars do not lose so much mass during the red giant phase, so they do not become subdwarfs," Silvotti told SPACE.com. "This is a very particular evolutionary channel." Even more unusual, V 391 Pegasi pulsates, dimming and brightening for several minutes at a time. By making precise observations of the timing of the pulses for seven years, Silvotti's team detected a giant gas planet in the system that was gravitationally tugging the star to and fro as seen from Earth. 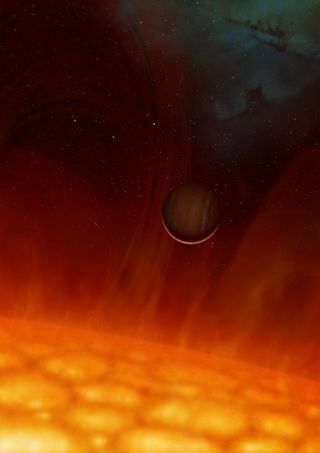 "This is the first planet found after the red giant phase [of its star]," Silvotti said. The planet is about three times the mass of Jupiter and currently orbits its star from a distance of about 1.7 astronomical units (AU), or about 158 million miles (a bit further out than Mars currently orbits the sun). One AU is equal to the distance between the Earth and the sun. Scientists think that during V 391 Pegasi's red giant phase, only about 1 AU separated the star and planet. It's possible that the planet's presence has something to do with V 391 Pegasi's premature shell ejection, but more cases will be needed to confirm this. "If we happen to find other stars like it that have planets, then you might ascertain that the planet has something to do with the star losing its mass," said Jonathan Fortney, an astronomer at NASA Ames Research Center in California who was not involved in the study. "But there's no agreed upon way for why this happens." Because very few red giants are expected to go through what V 391 Pegasi did, the new discovery will likely not have direct implications for whether Earth will or will not be engulfed by our sun, Silvotti said. It's almost certain that the two planets closest to our sun, Mercury and Venus, eventually will be vaporized, and that Mars will not, Silvotti said. "But Earth is in the middle, so we don't know," he said. Silvotti thinks the new finding will spur scientists to look for other planets that have survived their star's red giant phase. Maybe then, Earth's fate can be determined. "For sure this discovery will move other people to look for other similar systems, so in a few years we will have much stronger constraints for the models," Silvotti said. "At that point, it will be possible to do relatively good models for what happens to the planets in general in the red giant phase. So in the end we might know what will happen to Earth."